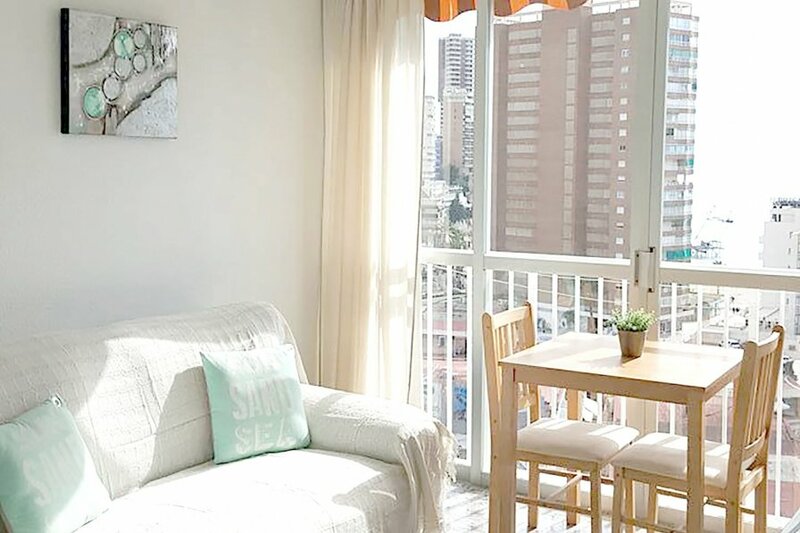 This 1 bedroom apartment with shared pool is located in Benidorm and sleeps 2 people. It has parking nearby. Take at this great cosmetically reformed one Bedroom 12th Floor apartment located in the Rincon de Loix area of Benidorm. There is a Lounge Dining room with enclosed balcony with fantastic Sea and Beach Views, UK TV and internet available at additional cost. The apartment has a Fitted Bathroom with a walk in shower, there is a fitted equipped Kitchen with hob and microwave. The apartment has one double Bedroom with fitted wardrobes and one fold out bed suitable for children. This apartment is located within a secure block with porter and CCTV. There are Communal pools, well kept communal garden and children´s park area and parking included in the rental price. The apartment block is located close to all amenities shops, supermarket, cafes, medical centre and is within walking distance to Levante Beach.